Donald L. Burnett was a life-long resident of Pawnee County and joined the firm in 1958. As senior partner, he had more than 50 years of practice experience, all of it with the firm. He served as a member of the Board of Editors of the Kansas Bar Journal and as a member of the Judicial Council probate advisory committee when that Committee redrafted mental hospital admission laws. A graduate of the University of Kansas and its law school, he was a past President of the Larned Chamber of Commerce and Larned Rotary Club. 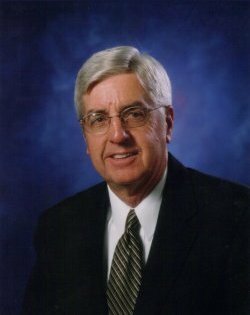 He also was President of the Pawnee County Bar association and the Jordaan Foundation, Inc.
His primary practice was in testamentary documents, wills, codicils and estate planning; also real estate, probate and trust administration, and oil and gas leasing. Mr. Burnett passed away on December 18, 2017.